← Was dog domestication the critical advantage for Sapiens over Neanderthalensis? There has been a gap of 50-65,000 years between the genetic time-line of the Out-of-Africa theory and archaeological indications of the earlier presence of anatomically modern humans outside of Africa. But the genetic evidence is now going back in time and approaching the archaeological time-line. “Out-of-Africa” is beginning to look much more like “Out-of-Africarabia”. that archaic Homo sapiens evolved to Anatomically Modern Humans in Africa, between 200,000 and 150,000 years ago, and that members of one branch of AMH left Africa around 60,000 years ago and rapidly spread across Asia to Australia and across Europe replacing other branches of humans they encountered. Though there may have been many migrations out of Africa only the one at around 60,000 years ago – based on genetic dating – spread successfully. Genetic dating indicated that the date of the origin of O-a-A was some 60,000 years ago but this did not quite match the archaeological indications that migrations of AMH were occurring upto 125,000 years ago. That all non-African populations today are descended from a relatively small group of AMH (mtDNA haplogroup L3) seems fairly certain but the time from when, and the location from where, the descendants of L3 spread cross the world now seems to be shifting. The archaeological finds in Arabia (the Nubian complex) and the discoveries in India (Jurreru Valley) indicate the presence of tool-making and tool-using cultures characteristic of AMH firstly in Arabia earlier than 100,000 YBP and in central India prior to the Toba eruption (74,000 YBP). I find the archaeological results quite compelling because, for the first expansion, migrations along the river valleys of 80-90,000 years ago across Arabia, across the then fertile Persian Gulf and into central India -it seems to me – are far more likely than coastal migrations. It also seems to me that the relative scarcity of archaeological evidence of this region from this time is because it is now mainly buried away under many fathoms of water around the coast of Arabia and in the Persian Gulf. All in all, I’d say that my “two deserts” theory whereby a Green Sahara pumped early modern humans to Asia prior to 100,000 years ago and then a deteriorating Arabian desert pumped them out post-70,000 years ago is not obviously wrong. 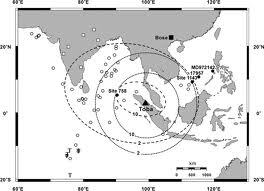 Perhaps the pre-100ky wave went much further to the east, to India and Southeast Asia. ScienceNow: …. our ancestors split from those of chimpanzees at least 7 million to 8 million years ago, more than 1 million years earlier than previously thought. …. Researchers have long used an autosomal mutation rate for humans that was based on a calibration of the split between humans and chimps (actually, other assumptions regarding effective population size were involved, but, in any case, a 2.5×10-8/bp/gen rate came to be widely used). More recently, a variety of studies using a variety of techniques (latest one from ASHG 2012) all came up with a rate that is about half that value. 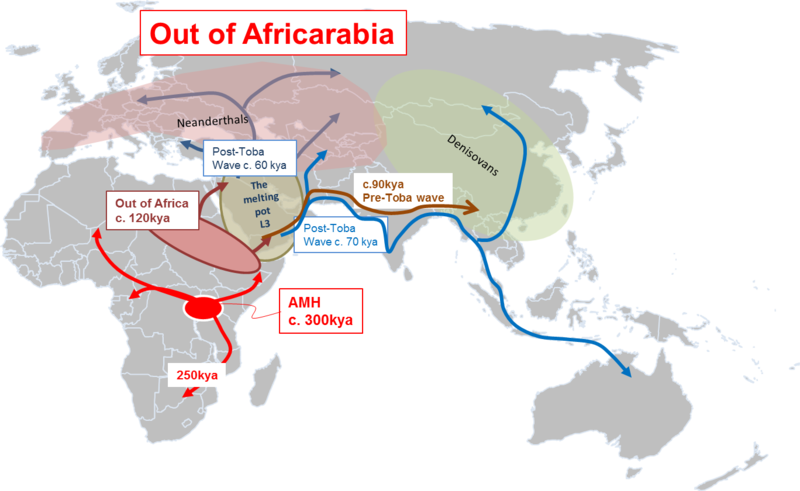 …..
At c. 70ka, the drying up of the Sahara and Arabia and/or the Toba eruption, became responsible for the Great Eurasian Bottleneck that is so often detected in genetic data. This event led some modern humans (Y-haplogroup: CF) to expand north Out-of-Arabia, where they intermixed with Neandertals and eventually “broke through” the Neandertal barrier to populate the rest of Eurasia. A second group of humans (Y-haplogroup: DE) expanded southwest (back-migrants into Africa, carrying Y-haplogroup E), or southeast (Y-haplogroup D, now having a relic distribution in Asia). Recent research is showing that the divergence between modern humans and both Neanderthals and Denisovans, which was originally estimated to be 272–435,000 years ago, is now being pushed back to 400–600,000 years ago. Archaic humans presumably also left Africa a million or more years ago – perhaps many times – and spread across Europe and Asia, leading later to the evolution of Neanderthals in Europe and Denisovans in Asia, in situ – so to speak. Admixture analyses are now also suggesting that AMH met and mingled with Neanderthals and Denisovans earlier and possibly over a longer period than thought before. Some of the AMH/Neanderthal similarities may be due to the remnants in AMH of the common African ancestor but recent work by Svante Pääbo’s team supports AMH/Neanderthal interactions taking place over the 37-85,000 YBP period. The date for the Denisovan interactions still remains uncertain but could have been around 30-40,000 years ago. Even the split between the Khoe–San and other anatomically modern humans within Africa probably happened over 250,000 years ago and not just 100-150,000 years ago. Chromosomal Adam and Mitochondrial Eve probably existed much earlier than previously thought. The origins of AMH in Africa then get pushed back to around 300,000 years ago. The Africans/non-Africans split seems to predate the appearance of modern humans in Europe and Asia by up to 60,000 years and this would take us to a time of about 100,000 years ago for this split. The time when Europeans and Asians went their separate ways from a common origin is being revised to be between 40 and 80,000 years ago. After AMH appeared in Africa, there was a divergence from the Khoe-san within Africa and the establishment of a separate population, including in N and N.E Africa, probably during the time of a green Sahara. This would have been followed by the “escape” and emergence from North-East Africa into a fertile Arabia /Persian Gulf around 120,000 years ago. They could have been driven largely by the desertification of the Sahara. Sea levels then were some 120m lower than they are now. Back migrations from Arabia to Africa also seem likely to have taken place around this time. Rather than a single explosive emergence/expansion event from the Horn of Africa sometime after the Toba eruption (74,000 years ago), there was first this earlier emergence into the Middle-East at 120,000 years ago (perhaps even many waves of emergence) from North and N-E Africa. Subsequently at least two major expansion waves from the Middle-East took place. First across just part of Asia and later comprehensively across Asia and Europe. For some 20,000 years (but still pre-Toba) – the pressure of increasing population and the start of desertification of Arabia could have led to a migration wave eastwards across sub-Himalayan Asia but not all the way to Australia. Northwards the Neanderthals were still blocking any major expansion. This first wave could have led to settlements following the river corridors and extending from present day Afghanistan through the fertile plains of central-India and reaching Indo-China (but not extending down to Southern India or reaching Australia). The critical bottleneck giving rise to the L3 haplogroup probably occurred in the 70-90,000 YBP period. It was perhaps due to desertification of Arabia – and not the desertification of the Sahara. This was also where the mingling with the Neanderthals first took place – perhaps in Eastern Turkey or Northern Iraq with repeated attempts of AMH to “escape” northwards. Then 74,000 years ago came the massive Toba eruption which all but wiped out the first wave settlements. It is less likely but not impossible that the Toba eruption itself caused or contributed to the bottleneck by creating a barren landscape to the east. Post-Toba, with the continued desertification of Arabia driving them, there could have been a second wave of expansion east and southwards across Asia. Genetic mingling then took place with the survivors of the first expansion and this time the migration reached all the way to Australia. The Neanderthal habitat which had been a barrier to a northwards migration earlier could have been shrinking and dissolving around this time. Other branches of this post-Toba expansion from Arabia led north and then both east across North Asia and west across Europe. Thus the two main directions of the post-Toba expansion gives rise to the European / Asian divergence at around 60,000 years ago. And the rest is pre-history. 150,000 YBP The beginnings of structured spoken language? 150,000 YBP Counting in use? 30-40,000 YBP AMH/Neanderthal – Denisova mingling? This entry was posted in AMH, Evolution and tagged Africa, Arabia, Out of Africa, Out of Africarabia, Out of Africarabia time-line, post-Toba expansion, pre-Toba expansion, Toba. Bookmark the permalink. Fascinating stuff! Thank you! 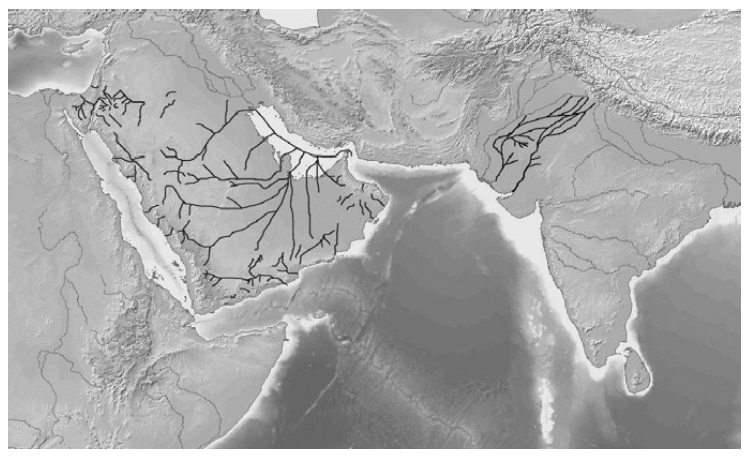 I had never seen that map of Arabian rivers before. Is it possible that they once served as the basis for river-valley “civilizations”? Probably. I think it is highly likely that ancient migrations followed the waterways.